A 33" strand of hand-strung beads. 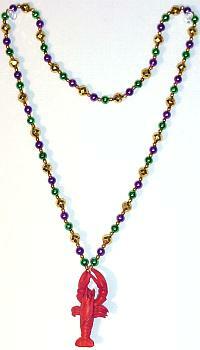 This bead consists of Purple, Green & Gold 8mm beads as well as gold metallic 10mm "disco ball" beads. Attached to the bead is a red crawfish (crayfish) which is 2.75" long.